1st place - Winner Cup and laptop Lenovo IdeaPad 500s-13ISK White Win10Home. 2nd place - 2nd place plate and smartwatch Suunto Spartan Trainer Wrist HR Steel. 3rd place - 3rd place plate and smartphone Huawei P10 Lite 32GB Dual Black. 4th place - diploma and Sony SRS-XB20 Bluetooth Speaker Black. 5th to 8th places - STIGA 60 table hockey. 9th to 16th places - Stiga Backpack Hexagon. 17th to 24th places - Stiga Training Water Bottle. Winners of Divisions 2, 3 and 4 got Cups. 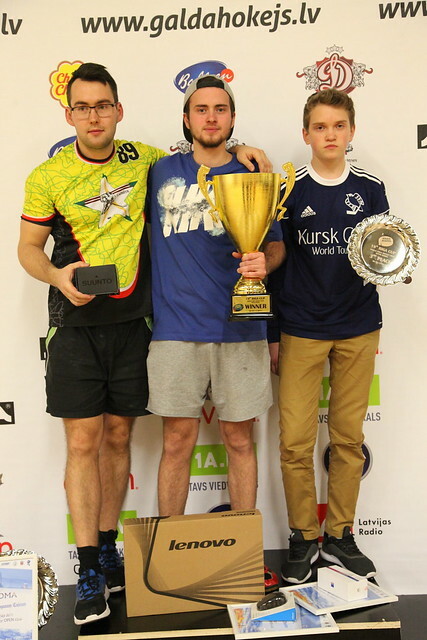 Player from qualification with higest place in main tournament - Vakoss Power Bank 10400mAh Black. All players of the main tounament - NIVEA MEN Active Clean Shower Gel. Qualification players got gifts from mentos and Bahlsen. Based on results in OPEN, the best ladies/veterans/juniors were awarder with Cup and Stiga Backpack Hexagon (alternative - set of basketball, football, volleyball balls + STIGA pump with needles).